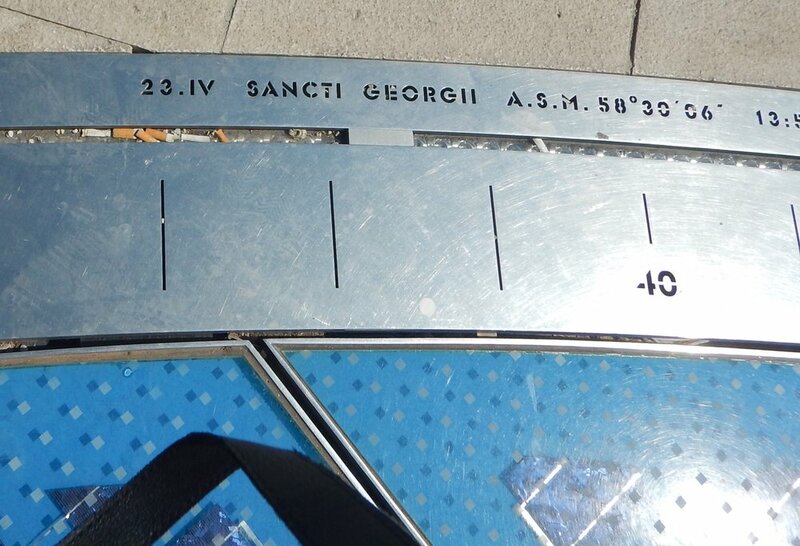 In Catalan, each year on April 23 Saint George's Day is a celebration of love, roses and books. .Young men give the girls a red rose ( the colour of the dragons blood) and the girls give the men a book. This is a touching tradition. Saint George's Day is also the anniversary of the death of Shakespeare and Miguel de Cervantes ( author of Don Quixote). Many authors rely on Saint George's Day to boost their book sales. While I was staying in the guest house in Oliana, just south of Andorra, the owners grandson explained this tradition to me. I had noticed earlier in the day while perusing the book shop next door that a local author has written and illustrated a beautiful children's book, in Spanish reminding the children of the legend. Yellow is the colour the Catalans have chosen to represent their quest for independence. They are wanting independence from Spain. It seems this struggle has been going on for many centuries. Four years ago a group of Catalanians organised a huge street march in Barcelona wanting the government to allow a referendum. It didn't happen, and many of the leaders were arrested and imprisoned. Some did leave Spain to avoid arrest and are in Belgium, France and Italy. 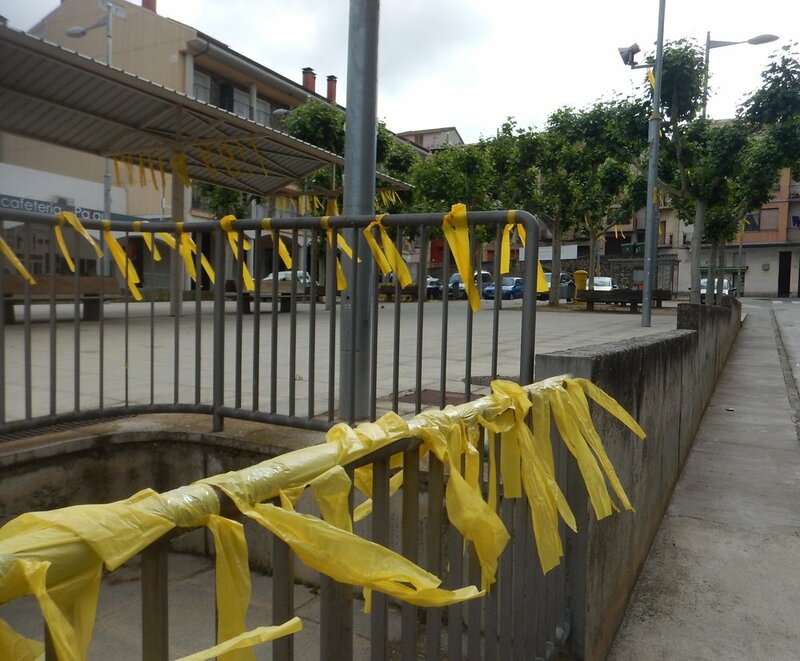 The yellow ribbons are to remind everyone that these imprisoned leaders need to be released without charge. The Catalanians are very passionate about this plea. in the restaurant 8 frequented for three nights running while at the Catalunya MotoGP I was thrilled to see this tile work hanging on the wall. The restaurant is owned by Jordi and his son Jordi, who explained the legend of St George and their passion for Catalanians independence. Jorge Lorenzo won the MotoGP, kind of in keeping with the theme of the times. 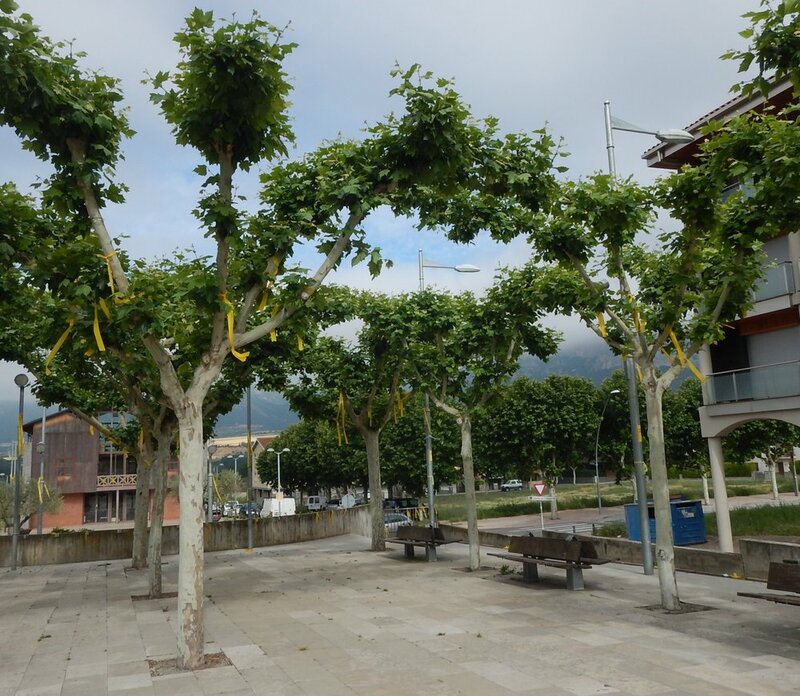 yellow flags and ribbons are everywhere in north east Spain, ie Catalan province. Even on this church. on many homes, well most really. signs in public squares and roadsides. and even on the road! the Oliana guest house make sure a special effort to celebrate Sant Jordi Day each year. this little girl was a bit shy about our Moroccan St George. Jo, if you are reading this can you please explain again! To me why's and wherefore of celebrating Saint Georges Day in the Christian calendar please. PortaRose guest house in Garessio, Italy. The legend of love and roses continue. . . .
My first night in Italy and I am lucky enough to be staying in the PortaRose guest house in Garessio. The original building, two towers and a drawbridge, was the main entrance to the medieval village (Borgo) in the 12th Century. The remaining tower is now part of the guest house. Their is an old medieval legend telling of the story of the lady of the Rosa bridge. She threw an enemy knight a red rose from a loophole in the tower. the knight hesitated a while then he mounted on his horse and picked up the rose drawing it near to his heart. but a quick hiss was heard: an arrow hit the knight, the red of his blood blended with the red of the rose. . .
Beatrice Rothschild had dragons and red hearts in her tiled floor of the central courtyard. Saint George pooped up in Italy too. Storm in a tea cup, Andorra style.